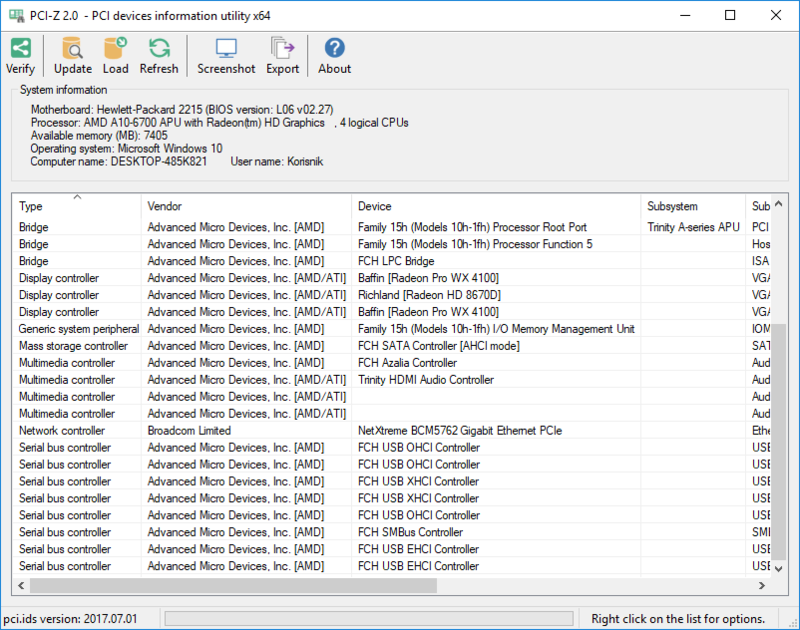 PCI-Z is designed for detecting unknown hardware on your Windows based PC. It will help you determine vendor, device and certain details about device even if you don't have drivers installed. Software uses The PCI ID Repository, a public repository of all known ID's used in PCI devices: ID's of vendors, devices, subsystems and device classes. It is used in various programs (e.g. The PCI Utilities) to display full human-readable names instead of cryptic numeric codes. You can find drivers for your operating system without a problem! Find drivers for your WiFi cards, audio cards, network cards or any other PCI peripheral. How to extract: Download the ZIP package according to your system and extract to a folder of your choice. Launch PCI-Z.exe. Optionally, update PCI ID database to the latest snapshot. Significant code changes and speedups, improved pci.ids database handling.